Webmasters: hotlinking is not allowed (and actually it does not work), please use the post url as download link. This is a maintenance version of GPU Shark that improves the management of Pstates (performance states) for NVIDIA GPUs. Now, GPU Shark 0.9.1 works fine with the GTX 760 version of GIGABYTE BRIX gaming system. 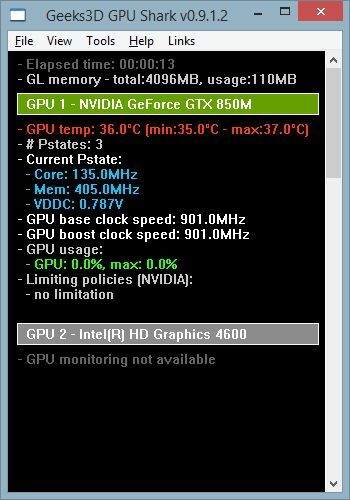 GPU Shark is a simple, lightweight and free GPU monitoring tool for GeForce and Radeon based graphics cards and is available for Windows only. GPU Shark offers a global view of all your graphics cards in a single window. More information HERE. 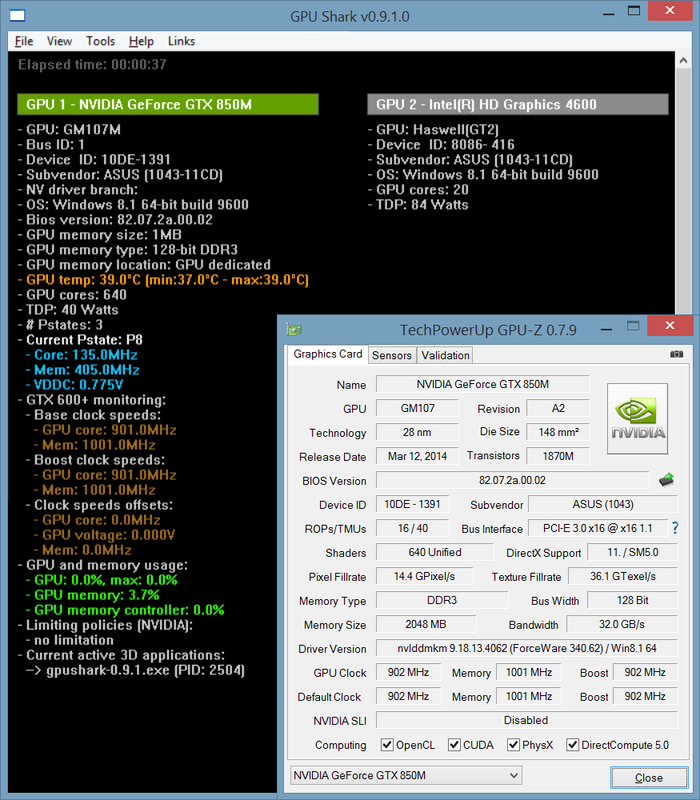 - added support of desktop GeForce GTX 970 and GTX 980. - fixed a bug in the driver version used for online submission. 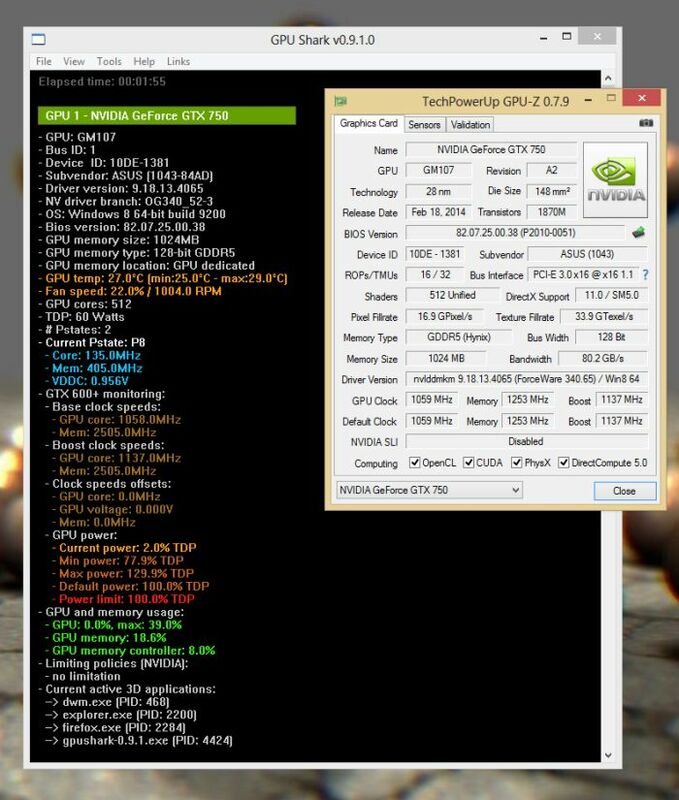 (tested on ASUS N550J with NVIDIA GTX 850M + Intel HD 4600). - NVIDIA GPUs: display of all Pstates as well as base and boost clocks. - fixed memory size reading for NVIDIA GPU. - improved GPU data reading for Intel GPUs. - improved the monitoring of NVIDIA GPUs (better Pstate management of recent GPUs). - added OpenGL info in the simplified view. - added support of GIGABYTE BRIX GTX 760. - updated online submission code. Still not quite correct on Maxwell. For example “Boost speed” is 1084.5MHz, instead of 901MHz. In fact, Maxwell don’t have nominal value, but the range. I have never read exactly 901MHz for the core clock, but 900.966MHz or 901.5MHz (those are the closest values). What library are you using for the readings? NVAPI reads different (and more precise, I guess) values. GPU Shark uses NVAPI for GeForce cards. What utility did you use to read your clock speeds? I’m not using any utility, but directly read values through my own profiler built in several applications. Currently NVAPI R337 is used with 340.62 drivers (Win8.1 64-bit). GPU memory size is incorrect. Maybe Optimus makes you some trouble, although it works correct with me (except PerfKit, but that’s another story). I updated GPU Shark (v0.9.1.1) and memory size for Intel GPUs should be okay now. Memory reading is OK now. But the performance state description can be improved. Thanks! 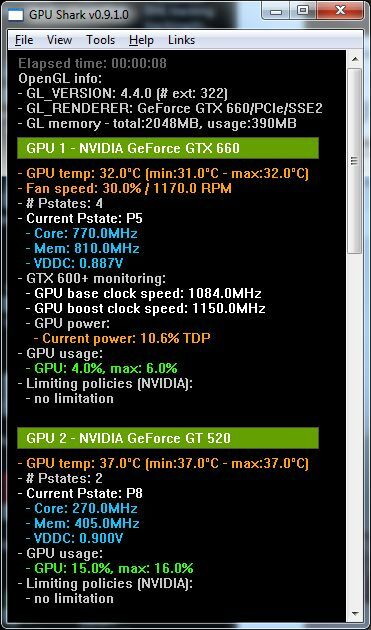 I currently have a notebook with GTX 850M + HD 4600. And I reproduced and fixed all the issues. I will upload the new version shortly. Be aware that the values you are displaying for the GPU speed are maximal values reported by NVAPI. 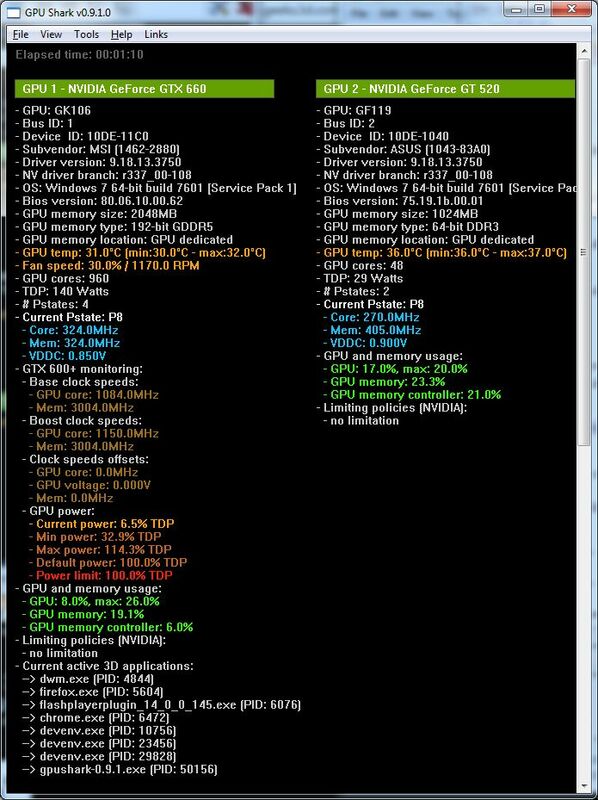 I’m not sure whether GM107 can be in, for example, P-State P5 and have GPU speed 1084.5MHz (I haven’t reached that state) or not, but that’s reported. That’s why I suggested to write a range of possible values for the states (e.g. P0 135-1084.5MHz, P5 135-1084.5MHz, P8 135-405MHz). Is the Intel HD 4600 GPU still not able to be monitored by GPU Shark v0.9.2?